Kodak ScanMate i940 Scanner Driver. Kodak Document Imaging introduces the Scanmate i940, a portable document scanner for Apple Macintosh users. The manufacturer recommends a daily scan volume of up to 500 sheets for the DIN A4 device. In network operation it captures up to 20 pages or 40 images per minute in double-sided scanning mode with 200 pixels in black and white or grayscale and up to 15 pages or 30 images per minute at 200 dpi in color. With USB operation, the performance is a maximum of eight pages per minute and a resolution of 200 dpi. 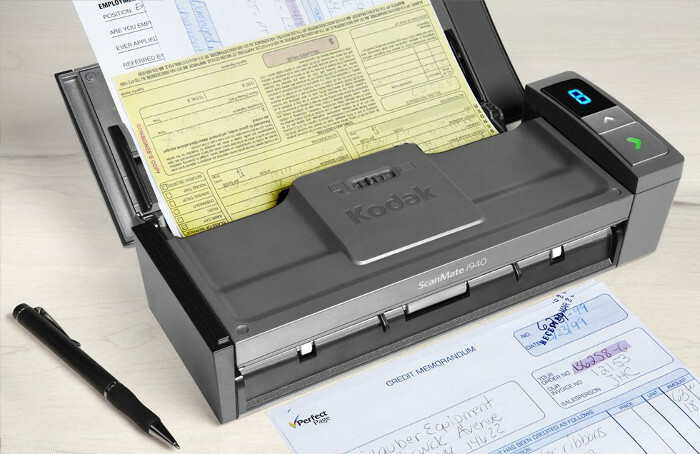 With the automatic document feeder, which holds up to 20 sheets of batch sizes, documents ranging from A4 size paper to business cards and ID cards and embossed plastic cards can be scanned. In the software, the Kodak Perfect Page technology and the Newsoft Presto! Page Manager 9 united. This combination should enable high-quality and easy-to-process images to be retrieved. It also includes OCR text recognition, full-screen display, and a document palette that lets you convert files to PDF files and send them. Other image features help to correct and improve document quality, such as automatic alignment, auto-cropping and straightening, image rotation, and automatic brightness and contrast adjustments. Also, the distribution of documents is facilitated by Page Manager 9 to the networked folders and cloud systems Google Docs and Evernote. The scan keys can be individually customized for quick access to frequently used file directories and applications. Also included is the Newsoft Presto Bizcard Xpress program for managing contact information from scanned business cards.